This week’s challenge is “Unusual Point of View“. The first view was taken from a sampan. We were travelling through a limestone sea cave in Langkawi, Malaysia. 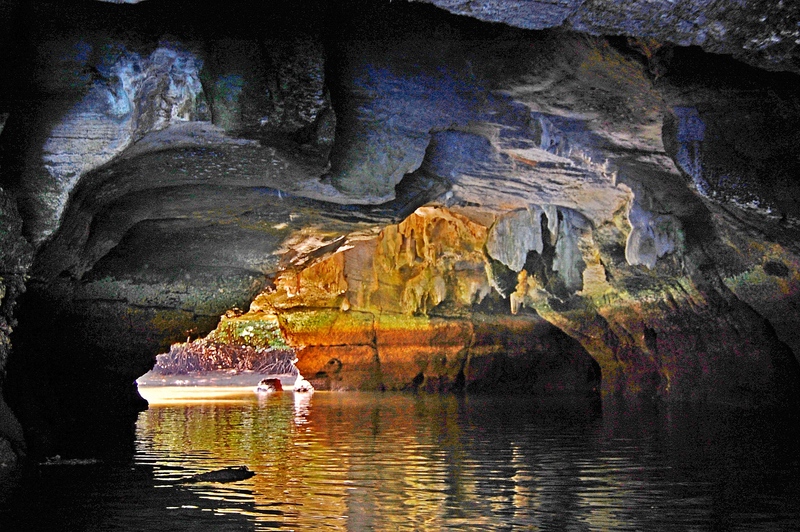 Inside the cave, my eyes, and my camera were directed to the rugged and dark surfaces of the sea cave. Natural light eventually came through when we were approaching the other end of the sea cave. It was a moment of contrasting beauty – we have the dark rock surface on the left, transiting into a colorful layered rock on the right and through this, we have light at the end of the cave revealing the marshy area outside. 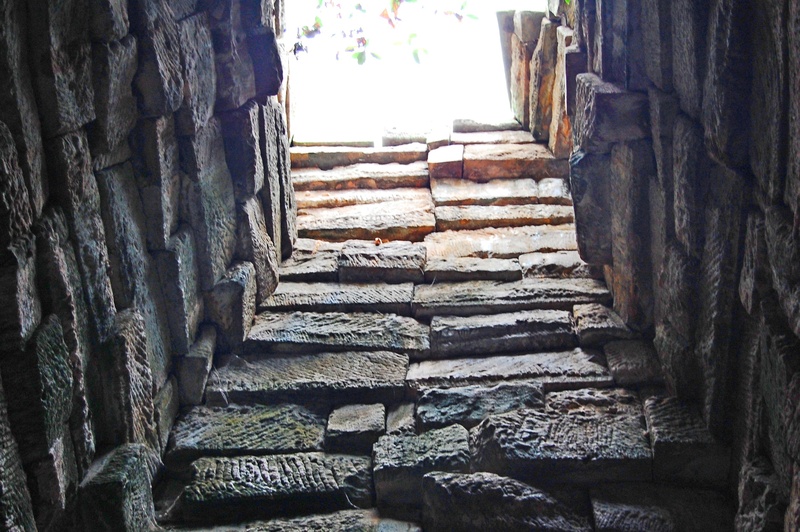 The second view was taken from down under in the Angkor Wat temple in Cambodia. The temple has sort of skylight so as to allow sunlight coming in. I was viewing the sky from deep down; as if I was viewing it from a well. The stone blocks forming the four sides of the well are rough textured, non uniform and quite crude. I was glad that I wasn’t stuck forever in a deep well! Fantastic shots. The first one has a very magical and an unusual effect. It almost looks like a place out of this world. I think you captured the light and dark ares smartly. Very ethereal. The second shot is also very amazing and thank God you were not stuck forever in the deep well, it would have been a very scary experience 🙂 Thanks for sharing lovely photos with us. The first photo is stunning and I like the second one too. I haven’t got mine up yet, it’s scheduled for tomorrow but boy do you make them look lame compared to this. Beautiful pictures! I love the contrasts between light and dark! Your first shot is stunning! I love the colours etched in the rock. Great photos, as usual! My favorite is the sea cave. That’s a scary thought Michael. Theses are really unusual. Thanks for sharing. You are a gifted photographer, Michael! Very beautiful! You have truly captured the essence of the challenge. Magnetic images! The contrasts you refer to as well as the contrast of hue (first image) and tone draws the viewer in… . A very beautiful picture of the sea cave. The photograph in the sea cave is stunning! It looks like a precious moment of peace and beauty. ‘I was glad that I wasn’t stuck forever in a deep well!’ You would have to learn to rock-climb pretty quickly. 😀 My eyes weren’t drawn upwards towards the light in this one, but too the lovely patterns on the stone. I love both images. The transition from the dark textures of the cave to the vivid daylight colours really draws the eye through the picture. The rough texture of the stone blocks in the second image make them look almost more like the ends of timbers than stone. Fascinating. Looking at your photos always makes me want to grab my rucksack and head on out to see if I can find equivalent spaces of my own. Your images are a joy and a temptation. the cave photo is stunning. I imagine the lighting conditions made it a bit of a challenge tto take. Stunning photo of the sea cave. I like the contrasting colors and textures of water and rocks, as well as doorways and windows from one visual space to another. We will be traveling along the central California (USA) coast this week. I shall be practicing my techniques with these images. Excellent choices! I like them both. I miss your photos Michael! So glad I am back here. Yes, I also notice your absence. Welcome back ! This is probably the most beautiful picture I have ever seen. Amazing, Mike! How are you able to find such beautiful angles and lights and all? You travel the most magical places. Thanks for sharing your beautiful photographs with the rest of us. Doesn’t it feel like Ariel from The Little Mermaid might swim into that grotto any minute? So pretty. Great POV, love the picture of the cave. Wow! The photo of the cave is marvelous, Michael! Michael, thanks for sharing these! Changing from the typical point of view, really adds a totally different feel to an image…these are wonderful! Glad that you like the pictures. I have another post on Unusual POV, hope you like that as well. Have a great week ahead! Really, really beautiful! Breathtakingly, beautiful! God’s wonders always inspire awe! Thank you so much for sharing such beauty! The photo inside the cave is breathtaking! Thank you for sharing that. I know…”now”, that you Mr. Lai, have that secret, sacred, link with nature, to know where, and when to be, at the right time, to capture the hatching of the most beautiful , and suggestive moments in natures language. “Congratulations”, and “God Bless”. OH! !, you are doing it already for sure. I have generally a very good perception for detecting this kind of persons. “keep it going, all your doings”. “I’m one of those that are following”. “Thank You”. Grateful for your following and comments!